Having a large yard can be fantastic, but having a large yard that you don’t — or can’t — use is frustrating. While figuring out what to do with a large backyard can seem difficult, you do have a variety of options, ranging from budget-oriented large yard landscaping ideas to deluxe outdoor living structures. At Keystone Custom Decks, we are outdoor living experts with decades of experience turning ordinary yards into an outdoor oasis. Whether you need large backyard ideas on a budget or you want to invest in the outdoor living space of your dreams, we have the ideas and the inspiration to make it happen. Check out our latest blog to explore some large yard landscaping ideas — as well as the outdoor living structures that will turn your empty space into something great! Your home décor is stylish, on-purpose, and functional. Your yard is the exact opposite, though: empty, unused, and hard to work with. With a little creativity, you can find the accessories to turn your large backyard from empty to exciting! Whether you opt for a fountain or a firepit, these features become a stylistic focal point of your yard. You’ll enjoy sitting near and taking in the ambiance of the fire structure — or you’ll admire the tranquil flow of the fountain. While our outdoor living structures can be customized with fire and water features, you can also select a portable option for the middle of your yard. On average, a quality portable fire or water feature from a big box hardware store will cost you around $500. See an example of how a firepit accentuates an already stunning outdoor living space. Gardening, planting, and landscaping can successfully fill space in large backyards. Large yard landscaping ideas can range from mulching and perimeter plants to flower beds and garden tracts. See how the striking landscape is another prominent feature of this project. This showpiece combo answers the question of what to do with a big yard. Another inexpensive way to furnish an empty backyard is with free-standing hammocks or other furniture. A popular backyard idea for big yards, hammocks, give you a place to get comfortable outside in the seclusion of your own backyard. You can buy a reliable free-standing hammock for around $100 or $200. One of the most classic — and most fun — ways to transform your backyard, installing a pool, puts your extra space to good use. Plus, most well-designed pools have a transfixing beauty about them. This is a perfect example of a large backyard that would have been challenging to furnish or use. Look at how seamlessly this pool, deck and hardscape combo transform this uneven hill into a backyard paradise. More of a visual feature than a practical one, some homeowners like to use portable arbors as a large yard landscaping idea. These popular products are often sold in big-box hardware stores and add interesting character to your yard, regardless of whether you cover them with ivy. Hardscaping with a paver patio or stamped concrete is a low-cost yet highly stylish option to fill empty yard space. While hardscaping is an exceptional choice for large and flat yards, it becomes far more expensive for sloped or unlevel plots of land. Notice how this hardscape and deck combo leads flawlessly into usable outdoor space. Not only are decks and porches our signature products, they are an exceptional way to fill unused yard space with a renovation you’ll enjoy every day. 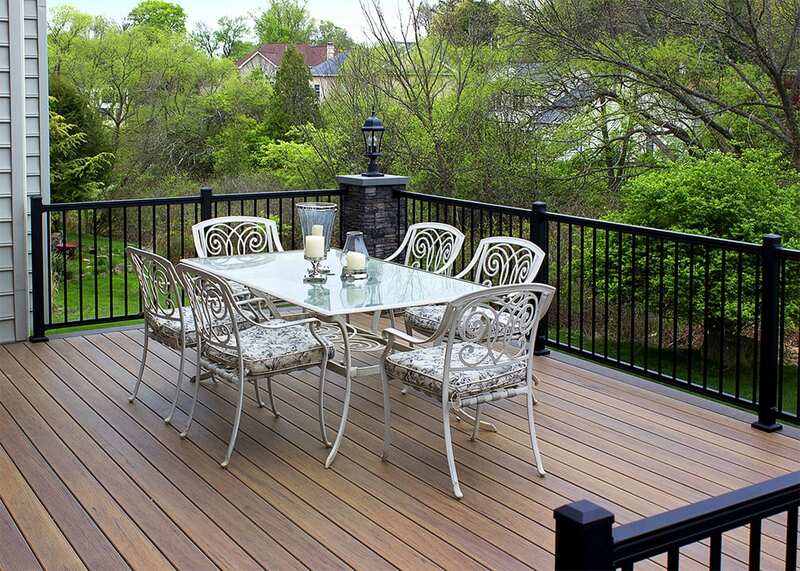 Since decks and porches are built off the ground, they compensate for uneven, unusable terrain. By building this outdoor living space, this family transformed their empty yard into space they’ll use every day. At Keystone Custom Decks, we work with our clients to create the outdoor spaces that meet their exact needs and fulfill their desires. We build a variety of stunning outdoor living spaces including porches, decks, and hardscapes. Contact us today to discuss how our decks, porches, and patios can accentuate your large yard landscaping ideas.